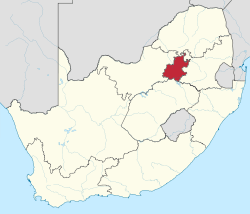 Gauteng (/xaʊˈtɛŋ/; Sotho pronunciation [xɑ́.ú.ˈtʼè.ŋ̀]), which means "place of gold", is one of the nine provinces of South Africa. It was formed from part of the old Transvaal Province after South Africa's first all-race elections on 27 April 1994. 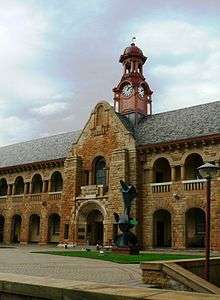 It was initially named Pretoria–Witwatersrand–Vereeniging (PWV) and was renamed "Gauteng" in December 1994. The name Gauteng is derived from the Sotho name, "gauta" meaning "gold" with the locative suffix "-eng". There was a thriving gold industry in the province following the 1886 discovery of gold in Johannesburg. 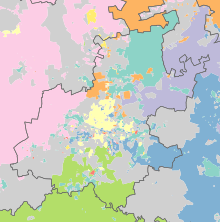 In Sesotho, the name "Gauteng" was used for Johannesburg and surrounding areas long before it was adopted in 1994 as the official name of a province. 1 2 3 4 5 Census 2011: Census in brief (PDF). Pretoria: Statistics South Africa. 2012. ISBN 9780621413885. 1 2 3 4 5 6 7 8 "General Overview of Gauteng" (PDF). Makiti Guides and Tours (Pty) Ltd. Retrieved 2 May 2013. 1 2 Stats in brief, 2006 (PDF). Pretoria: Statistics South Africa. 2006. p. 3. ISBN 0-621-36558-0. Retrieved 14 January 2011. ↑ "About Gauteng". Gauteng Provincial Government. Archived from the original on 4 August 2008. Retrieved 25 October 2008. 1 2 3 4 5 "Gauteng". South African History Online. Retrieved 3 May 2013. 1 2 3 4 5 6 7 "From mining village to commercial powerhouse – History of Gauteng". southafrica.net. Retrieved 3 May 2013. ↑ Location Settings (7 August 2012). "Johannesburg marvels at rare snowfall". News24. Retrieved 19 May 2013. ↑ 7 August 2012 at 10:53pm (7 August 2012). "Snow forces road closures across SA – South Africa | IOL News". IOL.co.za. Retrieved 19 May 2013. ↑ "World Weather Information Service – Johannesburg". Worldweather.wmo.int. 5 October 2006. Retrieved 19 May 2013. ↑ "Johannesburg Securities Exchange". The City of Johannesburg. Retrieved 14 April 2013. ↑ "Vodacom History". African Wireless. Retrieved 14 April 2013. ↑ "MTN Home". MTN Group. Retrieved 14 April 2013. ↑ "Neotel Contact Us". Neotel. Retrieved 14 April 2013. ↑ "Microsoft ZA Home". Microsoft. Retrieved 14 April 2013. ↑ "Porsche South Africa". Porsche. Retrieved 14 April 2013. ↑ "SANRAL". National Roads Agency. Retrieved 2 May 2013. ↑ "COSATU, DA, SANCO agree joint petition on Gauteng tolls". Politicsweb.co.za. Retrieved 2 May 2013. ↑ "Government Gazette" (PDF). South African Government Printing Works. 25 October 2012. Retrieved 2 May 2013. 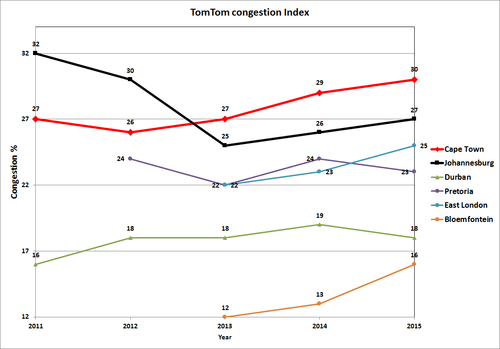 ↑ "TomTom Traffic Index". Retrieved 29 November 2015. ↑ "R750 million to fight traffic in SA's most congested city". Retrieved 29 November 2015. ↑ "Learnership Opportunity with PUTCO". idrive.co.za. Retrieved 2 May 2013. ↑ "About Us: Mr. Franco Pisapia, the MD of PUTCO Ltd.". PUTCO. Retrieved 2 May 2013. ↑ "Home". Rea Vaya. Retrieved 23 October 2011. ↑ "IDP PLANS FOR THE FUTURE". Rea Vaya. Retrieved 2 May 2013. ↑ "Objectives, Gautrain – The Gautrain Project". Gautrain. Retrieved 2 May 2013. ↑ "Welcome to Metrorail.". Metrorail. Retrieved 2 May 2013. ↑ "Gautrain – Buses". Gautrain. Retrieved 2 May 2013. 1 2 "City of Johannesburg – Trains". Joburg.org.za. Retrieved 19 May 2013. ↑ "Airports Company South Africa – O.R. Tambo International Airport". Airports Company South Africa. Retrieved 2 May 2013. ↑ "Rand Airport – Your Aviation Hub". Rand Airport. Retrieved 2 May 2013. ↑ "Lanseria International Airport – Home". Lanseria International Airport. Retrieved 2 May 2013. 1 2 3 "City of Johannesburg – Taxis". Joburg.org.za. Retrieved 19 May 2013. ↑ "Contact Us – CTI Education Group". Cti.co.za. Retrieved 19 May 2013. ↑ "Face to Face Campuses". Educor. Retrieved 19 May 2013. ↑ "College South Africa | SA Colleges". Lyceum.co.za. Retrieved 19 May 2013. ↑ "Contact Us". Mgi.ac.za. Retrieved 19 May 2013. ↑ "Contact us – Monash South Africa". Monash.ac.za. Retrieved 19 May 2013. ↑ "Contact Us". StAugustine. Retrieved 19 May 2013. ↑ "Tshwane University of Technology – Contact Us". Tut.ac.za. Retrieved 19 May 2013. ↑ "Contact UJ". Uj.ac.za. Retrieved 19 May 2013. ↑ "About UP > University of Pretoria". Web.up.ac.za. Retrieved 19 May 2013. ↑ "Unisa Online – Campus maps & addresses". Unisa.ac.za. 29 October 2012. Retrieved 19 May 2013. 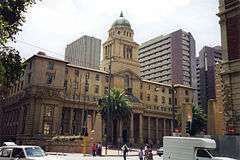 ↑ "Wits University – Wits University". Wits.ac.za. Retrieved 19 May 2013. 1 2 By Mariné Jacobs Johannesburg, 17 May 2013. "Govt denies Gauteng Online is ineffective". ITWeb. Retrieved 19 May 2013. ↑ "Education get lion's share of Gauteng's funds". iol.co.za. 5 March 2013. Retrieved 2 May 2013. ↑ "Green tourism – Gauteng Tourism Authority". Gauteng.net. Retrieved 19 May 2013. ↑ "City of Johannesburg – Joburg's urban forest to grow". Joburg.org.za. 30 August 2007. Retrieved 19 May 2013. ↑ Hamilton Wende, CNN. "Johannesburg expands its urban forest". CNN.com. Retrieved 19 May 2013. 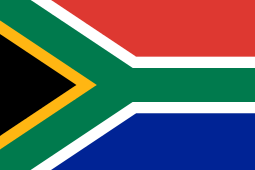 ↑ "Host nation of 2010 FIFA World Cup − South Africa". FIFA. 15 May 2004. Retrieved 3 May 2013. ↑ "Host nation of 2010 FIFA World Cup – South Africa". FIFA. Retrieved 3 May 2013. ↑ "Soccer City Stadium – Johannesburg". FIFA. Retrieved 3 May 2013. ↑ "A guide to all the stadiums to be used at the 2010 FIFA World Cup in South Africa – FIFA.com". FIFA. Retrieved 3 May 2013. 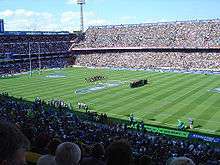 ↑ "IRB Rugby World Cup – Johannesburg, 24 June 1995, 15:00 local, 13:00 GMT". ESPN. Retrieved 3 May 2013. ↑ Stephenson, Hunter (14 March 2009). "First Look: Clint Eastwood's The Human Factor with Matt Damon". slashfilm.com. Retrieved 3 May 2013. ↑ Archived 28 February 2013 at the Wayback Machine. ↑ "The Gauteng Marathon | Runner's World Magazine". Runnersworld.co.za. 2 September 2012. Retrieved 19 May 2013. ↑ "Arwyp Medical Centre 15km Nite Race | Runner's World Magazine". Runnersworld.co.za. 26 January 2011. Retrieved 19 May 2013. ↑ "Trisport Joburg City Triathlon (incorporating CGT Champs) | Runner's World Magazine". Runnersworld.co.za. 6 February 2011. Retrieved 19 May 2013. 1 2 3 "Sports and outdoor events – Gauteng Tourism Authority". Gauteng.net. Retrieved 19 May 2013. ↑ "Gold Reef City > About Us". Gold Reef City. Retrieved 2 May 2013. ↑ "About The Zoo". Johannesburg Zoo. Retrieved 2 May 2013. ↑ "NZG – About Us". National Zoological Gardens of South Africa. Retrieved 2 May 2013. ↑ "Gardens". South African National Botanical Gardens. ↑ "The Johannesburg Botanical Garden". Johannesburg City Parks. ↑ "The Coca Cola-Dome – Venue Information". The Coca-Cola Dome. Retrieved 2 May 2013. ↑ "About – Gallagher Convention Centre". Gallagher Convention Centre. Retrieved 2 May 2013.